CoffeeScript is basically a primer for the CoffeeScript language: you’ll learn the basics of the language and also dive into some very basic chapters on jQuery and Node.js, but there’s a lot more to learn that you will have to find on your own. This isn’t necessarily a bad thing—some of my best learning experiences have been spurred by small, lean books—but this is probably not the complete reference on CoffeeScript. The hands-on work done in CoffeeScript comes from a game project that Trevor builds and improves from chapter to chapter. I like smaller, in-chapter projects as well as larger projects that span over multiple chapters, but sometimes the code didn’t seem very clean or easy to follow. Maybe some more pages devoted to writing and explaining the code would have helped, or perhaps the larger project could have been replaced with some smaller ones. There’s a few ways Trevor could rework the code and make it easier to learn. I really enjoyed reading CoffeeScript and would like to branch out into using CoffeeScript more to improve my code production. I’m looking for other books to take me further down the learning path, but the book has provided me a fine head start. Michal Zalewski, who has a strong pedigree in web security circles and wrote Google’s own Browser Security Handbook, has a really excellent book out called The Tangled Web: A Guide to Securing Modern Web Applications. I am really impressed by how thorough and comprehensive the book is—it’s 300 pages, quite dense and covers all the major topics on web security I can think of. It’s also very technical, so much so that I think its target audience is back-end developers and system administrators more than front-end developers. I’m not sure yet if front-end developers need to know everything in The Tangled Web or should worry more about the bits that they can do something about and leave the rest for their colleagues on the back end. There’s not much I can say against The Tangled Web: it is comprehensive, clearly written, and technically accurate. I think front-end developers can definitely get a lot of use out of it but some chapters cover topics they can’t always do anything about, such as server connections. Back-end developers, database programmers and system admins will probably have the same reaction to those early chapters on front-end programming. Before you buy, read the outline of The Tangled Web’s chapters and see if the book is a good fit for you. The Book of Ruby by Huw Collingbourne covers the Ruby programming language, which is popular as part of the Ruby on Rails framework for building websites and web applications. I thought it was a good primer on Ruby for the average beginner but there are some things that keep it from really standing out against all the other Ruby books on the market. My first difficulty with the book is the explanation on installing Ruby at the very beginning. I had a hard time understanding what to download and how to install Ruby on my Mac, and I ended up having to do a lot of digging on the Ruby website to figure it out. I think Huw should have covered this a lot more thoroughly, particularly for Ruby beginners. Once I installed Ruby, I found the rest of The Book of Ruby to be interesting and educational. 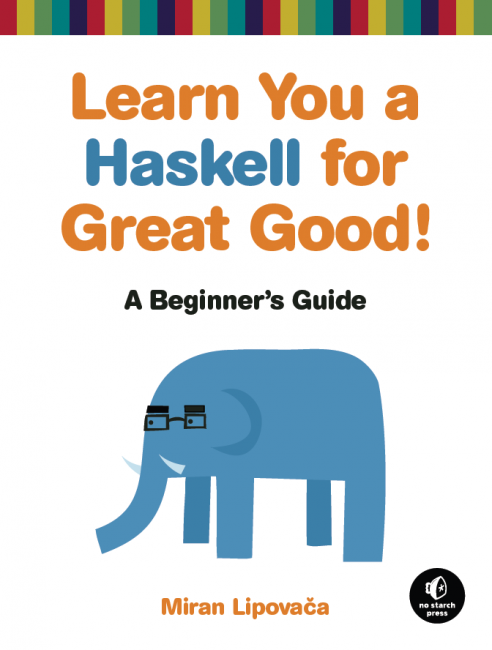 Huw’s writing style and tone is clear and to the point, which actually sets it apart from other No Starch books like Learn You A Haskell For Great Good!, which has a humorous tone and goofy cartoons in it. In contrast, The Book of Ruby is concise and even a little dry sometimes. I don’t mind this style, and I particularly appreciate Huw’s clean explanation of his code. I did notice that the coding style used through The Book of Ruby isn’t particularly consistent, and it does make some code hard to understand sometimes. That doesn’t bother me, but I know other Ruby developers find a consistent style to be very important for reading Ruby code. One thing I really find to be missing from The Book of Ruby is hands-on coding projects. I learn more from complex examples and project tutorials, and this book doesn’t really have those. The Book of Ruby‘s strength is in explaining concepts and being a good reference but there aren’t really any projects to work on and I wish there were more ways to tinker with Ruby code. I also think there should be much more devoted to Ruby on Rails than just one chapter, even though technically Ruby is a separate language. Ruby on Rails is a major driving force in Ruby development and I think the book would be more complete with more pages devoted to it. Programmers who don’t know Ruby might find The Book of Ruby useful as a resource for learning concepts and the scope of the Ruby language. I think there are better resources in print and online for actual hands-on Ruby experience, but The Book of Ruby can help build a good foundation for Ruby development.